White 2018 Porsche Macan Turbo AWD 7-Speed Porsche Doppelkupplung (PDK) 3.6L V6 Recent Arrival! * 2019 Porsche Cayenne...Features include: AWD, Turbocharged, Bluetooth, Rear Vision Camera, Navigation, 12.3" Touch-Screen, SiriusXM Satellite Radio, DVD-Audio, Internal Memory Capacity (GB): 40 GB, Leather Seats, Power Heated Mirrors and Keyless Entry. * 2019 Porsche Cayenne...Features include: AWD, Bluetooth, Rear Vision Camera, Navigation, 12.3" Touch-Screen, SiriusXM Satellite Radio, DVD-Audio, Internal Memory Capacity (GB): 40 GB, Leather Seating, Power Heated Mirrors and Keyless Entry. Mahogany Metallic 2019 Porsche Cayenne AWD 8-Speed Automatic with Tiptronic 3.0L V6 Recent Arrival! Volcano Gray 2019 Porsche Panamera GTS AWD 8-Speed Automatic V8 Recent Arrival! 3m 2019 Porsche Cayenne AWD 8-Speed Automatic with Tiptronic 3.0L V6 Recent Arrival! * 2019 Porsche Cayenne S...Features include: AWD, Twin-Turbo, Bluetooth, Rear Vision Camera, Navigation, 12.3" Touch-Screen, SiriusXM Satellite Radio, DVD-Audio, Internal Memory Capacity (GB): 40 GB, Power Moonroof, Leather Seats, Power Heated Mirrors and Keyless Entry. * 2018 Porsche Macan...Features include: AWD, Turbocharged, Bluetooth, Rear Vision Camera, 7.0'' Touch-Screen, SiriusXM Satellite Radio, DVD-Audio, Internal Memory Capacity (GB): 11 GB, Leather Seats, Power Heated Mirrors and Keyless Entry. * 2018 Porsche Panamera...Features include: AWD, Turbocharged, Bluetooth, Rear Vision Camera, 12.0" Touch-Screen, SiriusXM Satellite Radio, Apple Car Play, Internal memory capacity (GB): 10, DVD-Audio, Power Moonroof, Heated Front Leather Seats, Heated Rear Seats, Power Heated Mirrors and Keyless Entry. Welcome to the car shopping experience that you’ve been searching for. 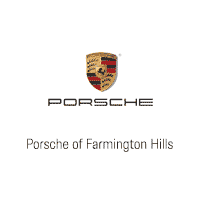 Here at Porsche of Farmington Hills, we make it easy for you to locate your dream car. We do this by keeping a large selection of premium models that have all the popular features that Porsche drivers love. We don’t stick you in the leftover vehicles that have been picked over nor in old stock that has not been updated for a few years. No, we want to bring you the latest technology and an amazing level of customer service that streamlines the entire purchase process. You won’t ever feel like you are missing out on something or that you need to look elsewhere to find the right deal since you are laying down a lot of money. We are like the supermarket of Porsche’s premium products rather than the corner store that has a few conveniences at ridiculous prices. We never back you into a corner and force you to buy one of our models or jack up the prices on popular models, way above list price. You always have the option to purchase a new Porsche directly from the factory with all the custom features that you desire and simply pick it up here. Buying a brand-new Porsche is a lifestyle choice. If you want your experience in a Porsche to be memorable and stress-free, why tie up your money in a used Porsche from a private seller that has a lot of ambiguities concerning the quality. When you buy a brand-new Porsche, you can relax because everything is covered by warranties and additional protections to ensure your complete customer satisfaction. This allows you to focus on having fun with your new purchase instead of worrying about hidden problems and whether you made a bad investment. A brand-new Porsche is exactly what you need to get your adrenaline pumping and to seize the day. Life goes by so fast. You can only wish when you are older than you took some of the indulgences in your youth to live a higher quality of life. Although a Porsche is fun to drive at any age, there is no time to settle for an ordinary daily driver, even if you just graduated college, or you are waiting on that big promotion. There is no sense in waiting. Change your lifestyle and invest in a vehicle that pays for itself with sheer driving pleasure and reliable performance that never ceases to amaze. Porsche is the second-most reliable brand in the world according to a recent study. For this reason, you should not expect any problems with your Porsche if you buy a brand-new model and baby it with factory parts and premium factory service for the life of ownership. Every Porsche is thoroughly inspected for fit and function before we put it up for sale. Our technicians lay their lifetime reputations on the line and the accountability of our dealership to guarantee your safety and satisfaction. When you are ready to experience the top-end of Porsche purchase processes, be sure to stop by Porsche of Farmington Hills for a test-drive. We also encourage you to contact our friendly customers care team with any questions you may have.